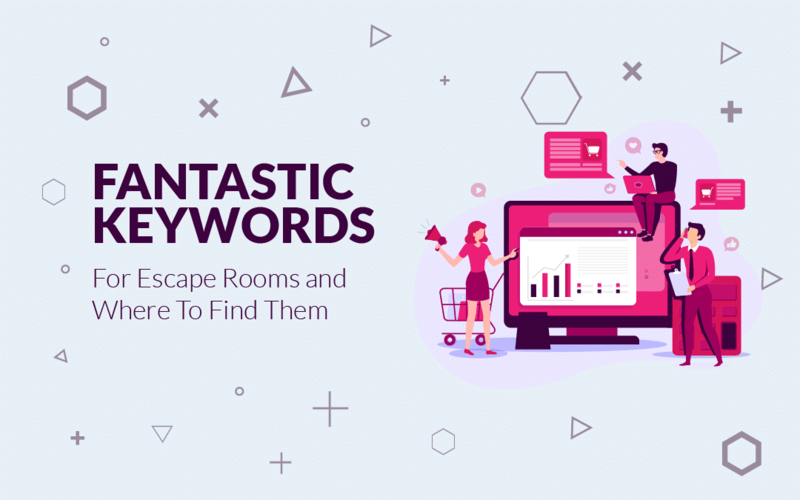 Keywords are the words and phrases people would use to search for your Escape Room online. From the POV of ads, they are used by Google to know which search terms should result in your ads being displayed. 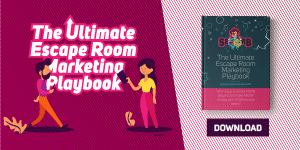 As you can understand, it is important to use the right keywords – speak in the language of those who’re searching for your Escape Room – for your SEO and PPC campaigns to reach their full potential. And that’s what I’ll discuss in this blog post – what the various kinds of keywords are and how you can generate them. And there’s a sweet bonus for you at the end. No cheating! A keyword is the word or phrase you would use to describe or summarize your Escape Room business to someone. From the POV of someone doing a Google search, it’s the word or phrase they use to describe what they are searching for. Keywords can be categorized into three broad types. Brand Keywords, Direct Money Keywords and Indirect Money Keywords. Let’s take a quick look at what these are. Any keyword that contains your brand name, partially or completely, can be referred to as a brand keyword. Brand keywords are the highest value keywords for your business, because people who are searching for these keywords obviously like your Escape Room and want to book a mission with you. They could be players who’ve booked your rooms in the past and want to come back for more; they could have been told about your Escape Room by friends or family; they may just have read about it in a review blog. In any case, they’re very impressed with you and want to book your rooms. [Your Escape Room] or [Your Escape Room] + [City] or [Your Escape Room] + [State]etc. Some people think that branded keywords are not worth targeting in paid ads since you’re in a sense ‘preaching to the converted’ but I beg to differ. You should ALWAYS target your branded keywords in paid ads, just like you would do other types of keywords that we discuss later. Allows you to capture high quality leads right at the brink of conversion. 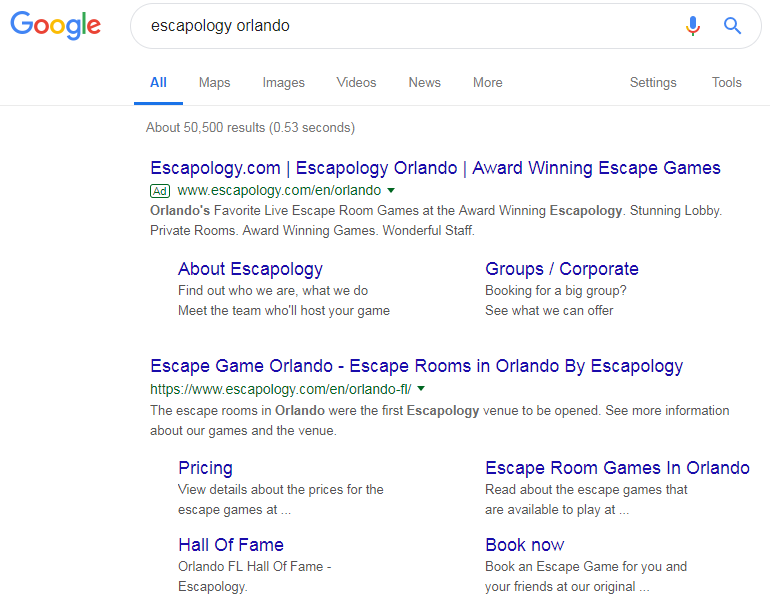 When you search for ‘Escapology Orlando’ on Google, you can see their advertisements just above their organic rankings. This allows them to become more prominent and ensure that the search converts into a website visit for their business. Direct Money Keywords are commercial intent keywords or phrases that players may search on Google right before they make a booking. They’re not hooked on to any brand as such but they are sure to take a monetary decision following this type of a search. For example, Fox in a Box Fullerton might advertise with terms such as Escape Rooms in Orange County, or Escape Rooms for Kids in Fullerton, Or Escape Rooms for Couples Near Me etc, as these are direct money keywords for it. The intent behind this search is clear. The surfer is looking for Escape rooms in their city, so that they can book an experience. Since these keywords will directly translate into revenue for one business or another in that city, these are called Direct Money Keywords. Other example of Direct Money Keywords could be, ‘2 players escape rooms in city’, ‘couple escape rooms’, ‘family escape rooms’, ‘escape rooms for kids in city’ etc. Indirect money keywords may not always be commercial intent. They are called indirect because they may or may not lead to a booking. For example, someone searching for ‘things to do in Orange County’ is almost definitely looking to do something to do that can result in a financial transaction. However, the search term doesn’t directly refer to an Escape Room, and that is what makes it indirect. Mind you, I am using a VPN to set my location to Rochester MN, so that I may see local advertisements. 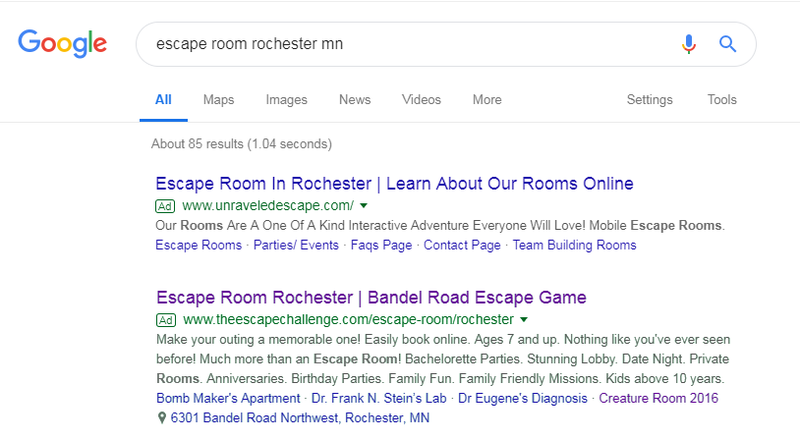 So, despite of missing the ‘location keyword’ in the search, Google is showing me an advertisement that is relevant to Rochester, Minnesota. As you can see, I was searching for things to do with kids and an Escape Room definitely fits the bill. So, an Escape Room ad definitely is relevant here. Now all of this might sound like a lot of guesswork. And it is…if you don’t know what you’re doing. We have taken the guess work out of keyword research and created a tool that will help you with just this, more on this later, but first let’s understand how to do keyword research. What Are Good Keywords for PPC and SEO for Escape Rooms? When doing keyword research for your Escape Room, you need to keep in mind all the different types of keywords that you should be targeting. Most keywords that you find will be good for both your SEO and also your Paid Ad Campaigns in Google and Bing. Now, this is in no way the most comprehensive list of keywords for an Escape Room. But this list can serve as a good starting point for any business, that wants to take away the guesswork from choosing important keywords for their business, and at the same time avoid the complexity of learning how to use advanced keyword research tools. When you go through this list, you will notice that the keywords can be easily segregated into different themes: branded, competitor, city and state, things to do, parties and events, team building, promos etc. One, If you want a more in-depth and exhaustive list for your business, and don’t want to leave any stone unturned, then you can do manual keyword research by using any of the aforementioned tools (We highly recommend Ubersuggest for starters) and using our list as a base for your research. 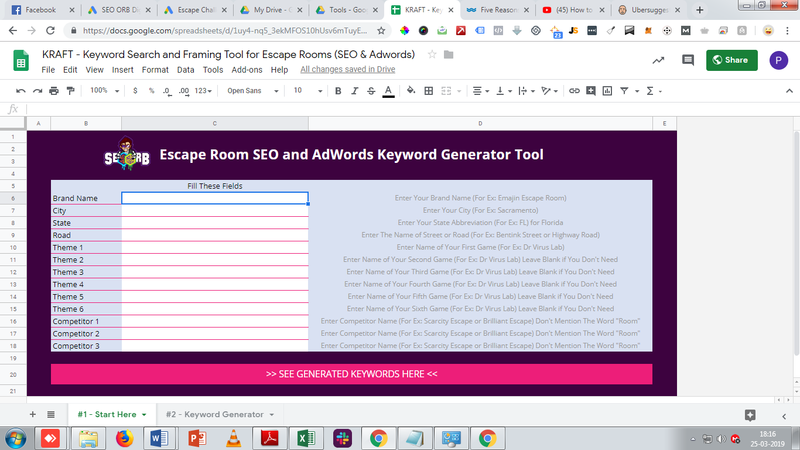 Two, You can use the SEO ORB Keyword Research And Framing Tool (KRAFT) to generate a list of useful and profitable keywords for your escape room business. What are the features of this tool? KRAFT takes the guesswork out of keyword search and categorisation for Escape Rooms by creating an intuitive solution that asks the user to input some basic details about their business and spitting out over 150 profitable and related keywords that can be used in the SEO and PPC efforts for that Escape Room. Along with this, KRAFT also helps to convert the extracted keywords into different Keyword Types that may be used in PPC Campaigns; more on this in the FAQ’s. What is the Price of this Tool? It is 100% free for our blog readers, at least for the moment. Visit the following link and make a copy of the tool in your Google Drive. Without a copy you may not be able to use the tool. Fill in the basic details about your business following the hints that are mentioned next to the user submit fields. Ensure that you only type in the column titled ‘Fill These Fields’. If you type elsewhere, the sheet won’t work because the pre-entered functions will be disturbed. Please note it is not mandatory to fill all the Theme fields and Competitor Fields. Once you are satisfied with your inputs, you can click on the Go To See Results Button to be taken to the results page. Keyword Groups shows you which theme the generated keyword belongs to. AdWords Keywords will allow you to convert the generated keyword into a specific keyword type for your PPC campaigns by selecting from the Keyword Type Dropdown Menu right above the column. 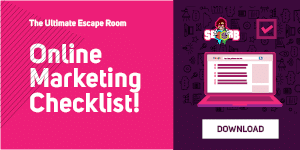 Now you can use the tool to easily create a relevant keyword list for PPC and SEO for your Escape Room. 1. Why do you have to enter your competitors’ names? It’s safe to say that people searching for competing Escape Room brands are eager to participate in an Escape Room. By letting those people see your ads, you’re offering them the chance to explore your Escape Room as well, increasing choice for them. And since a player would not like to play the same room twice, once they try the other rooms, they might be interested in trying yours as well. 2. What’s a Keyword Type? The same query can be made by different people in different ways. For example ‘New York City Dare2Escape’ and ‘Dere2Escape New York’ are the same search. Now trying to come up with all these combinations of similar keywords on your own would be an impossible task. That’s why Google came up with various kinds of Keyword Types or Matches, which indicate how much variation from your target keyword should be allowed in matching search terms with target keywords. Exact Match – Search terms will have to match your target keyword exactly for ads to be placed. Represented as [Dare2Escape New York]. Phrase Match – Your ads will be placed on exact matches and slight variations of the target keyword. For example ‘Dare2Escape New York City’ is a phrase match with ‘Dare2Escape New York’. Represented as “Dare2Escape New York”. Broad Match – Your ads will be placed if a search bears any similarity at all with your target keyword. For example the search term ‘Escape from New York’ is a broad match with the target keyword ‘Dare2Escape New York’. However you can intuitively understand that the person searching for ‘Escape from New York’ (a movie starring Kurt Russell if you don’t know) may not be interested in an Escape Room at all. This is good for bringing traffic to your website but not a good option for ads since you will need to pay Google every time someone clicks on your ads and broad match, if not optimized, can lead to a lot of irrelevant clicks and a consequent wastage of your ad budget. Represented as the plain keyword without any punctuation marks. Broad Match Modifier – This type will place your ads on searches that are similar to your target keyword. Spelling errors, change in the order of the words and synonyms are allowed but the sense of the search must remain the same. It restricts irrelevant searches while retaining some of the flexibility that Broad Match offers. For example ‘New York Dere2Esccape’ is a broad match modifier to ‘Dare2Escape New York’. Represented as +Dare2Escape +New +York. With that done, your list of keywords is there, ready to be used! 3. Do I need to use all the Keywords That KRAFT generates? The keywords as KRAFT presents them are divided into different groups representing different kinds of target keywords. There are keywords for ‘Promo Codes’, ‘Horror/Scary’ and so on. You should choose only those groups that actually apply to your Escape Room. For example if you’re not running any promotions, it makes sense for you to skip the ‘Promo Code’ group of keywords. Did you enjoy KRAFTing your keywords? Did we miss anything, any kind of keyword that you feel should be added? Please tell us in a comment below. And if you find KRAFT useful, remember to share it with other people who might also find it useful. 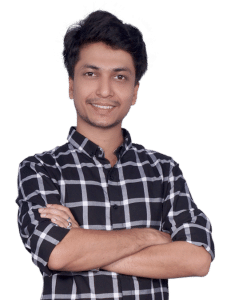 An escape room enthusiast himself, Piyush Agarwal is the founder of SEO ORB. His work with escape rooms has consistently been appreciated for achieving results and being transparent. When not working, Piyush can be found playing video games or board games. Click here to read more about him.